This article is a formal apology for publishing and distributing false doctrine. Humble Pie "If you find that the evidence on this site has misled you in the past, we apologize." 7 Where do we stand now? From the start, the purpose of Believethesign.com has been to provide evidence to support truth. Having grown up in a Message Church, the truth being supported was naturally that William Branham was Elijah the Prophet in fulfillment of Malachi 4:5 and Revelation 10:7. In the fall of 2011, we changed the main scripture reference of the website to “Jesus Christ the same yesterday and today and forever” (Hebrews 13:8) in order shift the focus of the site clearly onto Jesus Christ. The driving force behind this change is that we uncovered a number of significant issues with the evidence supporting William Branham’s prophetic ministry, as he proclaimed it. Since that time, we have also uncovered issues with his honesty, his healing ministry, and his word of knowledge. If I say anything that you don't believe, why, do it just like I do when I'm eating cherry pie. 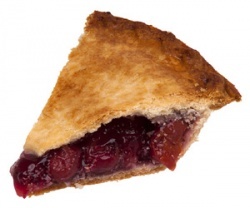 I love cherry pie. But when I hit a seed, I never throw the pie away; just throw the seed away. So you do the same thing. Eating chicken, when you hit the bone, you don't throw the chicken away, you just throw the bone away. If I say something you don't believe, just throw the bone away. (Conferences, June 8, 1963, Tucson, Arizona). What you now read on Believethesign.com should be an accurate historic account of William Branham’s life. By bringing to light supportable evidence, we hope that you find yourself in a better position to separate any pits from the pie. However, there is another analogy that concerns us even more. This quote was made over 50 years ago. As a result, the question must be asked: Is it time to move on? While our responsibility is simply to present the truth in love, our concern is that the Gospel of Jesus Christ has been replaced with a bowl full of rotten manna in Message Churches. Some of our major concerns are are described in the pages that are linked from this page (just click on the colored headings to go to the detail pages). Why it took so long for these things to surface is not clear. If you find that the evidence on this site has misled you in the past, we apologize. Furthermore, if you can find anything in this website that is not accurate, please let us know and we will change it. Thankfully, humble pie is always fresh. The following list contains the articles on Believethesign of prophecies made by William Branham. Beside the prophecy is a short summary of an issue that calls into question the validity of the prophecy. Some of these prophecies may still come to pass, while others cannot because they are in the past. The unfortunate truth is it appears that William Branham was more “miss some" than "hit some” with his prophecies. Click on headings if you want to read detailed commentary on a particular issue. William Branham told of a vision that he had as a child in which he saw the construction of the Louisville Municipal Bridge (now called the George Rogers Clark Memorial Bridge) take place on the Ohio River. During the building of the bridge, he claimed to have seen 16 men fall from the bridge and drown. He also claimed that the vision was perfectly fulfilled 22 years later. However, based on all public information available, only 2 individuals died during the construction of the bridge. Their deaths resulted from two separate accidents and neither involved drowning. William Branham returned to British Columbia in late July 1962, preached six services on Vancouver Island, and then went hunting in northern British Columbia but did not fulfill the vision at that time. He returned to British Columbia again in October of 1964 with Pearry Green, but did not fulfill the vision at that time either. When William Branham passed away on December 25, 1965, the vision had never been fulfilled. But on this final trip the vision again failed to materialized. William Branham's visa was restricted in a way that prohibited him from holding any meetings. He died just prior to the end of 1965 with the vision remaining unfulfilled. 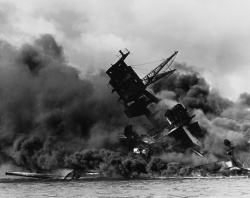 Photo: The USS Arizona sinks in Pearl Harbour on December 7, 1941. In 1960 William Branham said, I speak this in the Name of the Lord. The president which now is, President Franklin D. Roosevelt... will cause the whole world to go to war... took America to England's tea party. That's right. Germany never picked on us; we picked on them, throwed the whole world into a war, to cause a world war. Part of William Branham’s 1933 prophecy was that FDR would pick on the Germans, lead the world to war, and run for four terms. While Roosevelt was inaugurated four times, he did not pick on the Germans and followed the world to war after provocation by the Japanese. William Branham called Franklin D. Roosevelt a “rascal” in 1960, which indicates that he just did not like him. Many followers of William Branham's message point to the voice that was heard on the Ohio River as proof that William Branham was to forerun the second coming of Christ just as John the Baptist foreran Christ's first coming. However, when closely examined there are a number of problems with this story, including the fact that the first accounts make no reference of a voice. After a great deal of research, we are now of the view that William Branham's story of the baptismal service changed over time to include a voice when, in fact, no one that was there actually heard it. William Branham published a tract entitled “I Was Not Disobedient To The Heavenly Vision”, in which he outlines the vision that started his commission. The problem is that this vision is not the angelic commission that he tells about in his recorded sermon titled “I Was Not Disobedient To The Heavenly Vision”. Piles of bread, a tent, and a tabernacle of people that would not eat the bread are later forgotten, and replaced with an Angel. No reconciliation is ever provided. Part of William Branham’s 1933 prophecy was that Mussolini would rise to power, become a dictator, invade Ethiopia, and come to a disgraceful end. According to the vision, the invasion of Ethiopia would be his last. By 1933, Mussolini had already been a dictator for at least 8 years (he had already risen to power). His invasion of Ethiopia ended in May 1936 and was immediately followed by involvement in the Spanish Civil War starting in July 1936. During WWII, Italian troops helped Germany conquer France, and invaded Sudan, Kenya, British Somaliland, Egypt, Belgium, Greece, and the Soviet Union. William Branham mentions that this vision was “Thus Saith the Lord”, and that he wrote it down in 1933. This creates a problem as he identifies the Maginot Line, and says the vision occurred 11 years before it was fulfilled. Part of William Branham’s 1933 prophecy was that the three major “isms” of the world (Fascism, Nazism or Communism) would roll into communism, and then Russia would wind up in Catholicism. He prophesied that Communism would then burn the Vatican, and bring a persecution that would send Jesus Christ to the earth again. Unless Communism returns to Russia, an “ism” will not burn the Vatican. It makes no sense for Communism to wind up in Catholicism, and then burn the Vatican. In 1955 and 1961, William Branham said that these three isms were the three unclean spirits of Revelation 16:13. In 1965, William Branham said the three unclean spirits of Revelation 16:13 was the doctrine of the Trinity. It is unlikely that both explanations are correct. While Google has recently received a license for autonomous driving in Nevada, the Nissan Cube, Toyota Scion, and Kia Soul indicate that cars and concept cars are no less round today than in the 1950s. However, when William Branham told this prophecy, he said it had “already happened”. Looking at articles in popular magazines of the 1950s, it is possible to find written and artistic concepts of driverless, egg-shaped, electronic vehicles by the time William Branham publicly disclosed this prophecy in 1956 (egg shape) 1957 (driverless) and 1960 (electronic). While it sounds like a modern prophecy, women have been wearing fig-leaves since, well, Eve. Fertility goddesses have existed in almost every historic pagan religion, the nations around Israel often worshipped with temple prostitutes, and the Vatican has celebrated its holiness with statues of naked people for hundreds of years. A prophecy on the decline of morals in women is sensational, but misleading. Solomon said, “there is no new thing under the sun”, and the morality of the human race has never been great. Also, this part of the vision was never mentioned until 1964. There are a number of ways this prophecy could come to pass. Be it a physical woman, the Catholic church, or the women’s vote, this vision is sufficiently vague that it is likely to come to pass. In fact, William Branham indicated that this may have been fulfilled with JFK (a Catholic) in the White House. Every major empire in history has fallen, and it is likely that one day America will fall as well. The timing of this would be more helpful. However, 1977 didn’t happen as predicted. The only source of this prophecy is William Branham. We have not found any third-party verification that this prophecy took place. The Houston photograph appears to vindicate William Branham's statements in the 1940's that a "pillar of light" followed his ministry. However, the photographer's statement that it was a 'supernatural' light is based on William Branham's own recorded statement. While this prophecy was not recorded on the tapes, a boy was raised from a critical/dead state based on the testimonies of people who accompanied William Branham in Finland. What is troubling is that William Branham's story differs from other eyewitnesses who published their stories. William Branham said that a group of angels met him during a hunting trip to “Sunset Mountain”, and pointed to a picture of a cloud published in the May 1963 issue of Life magazine as a testimony of this event. From the testimonies of his hunting companions Gene Norman and Fred Sothman, William Branham was on Rattlesnake Mesa a week after the photo of the cloud was taken when they heard a boom like a sonic blast. Regardless of how spiritual it sounds, William Branham was not on Sunset Peak when the cloud appeared. The “profile” of William Branham on the side of Rattlesnake Mesa resembles a face, but it is not necessarily an accurate profile of William Branham. William Branham’s retelling of the events related to this hunting trip and the appearance of the cloud are so inconsistent with each other, that it appears he stretched the story. This removes confidence in his testimony and, ultimately, in the sermons on the Seals that followed. This prophecy appears to be an interpretation of the wording in the book of Revelation, as opposed to a formal prophecy. There were numerous prophecies of LA sinking in Pentecostal circles in the 1950s, the April 1, 1957 issue of Time Magazine included an in-depth report on parts of L.A that had already sunk as much as 12 feet. William Branham did not give his prophecy until the 1960's. William Branham also compared the sinking of Los Angeles to the sinking of Capernaum. However, Capernaum did not sink but was simply abandoned, and its ruins are still on the shore of the sea of Galilee to this day. This prophecy has not been fulfilled to date. Also, a lot of Message believers live in Florida, and are apparently undaunted by this prophecy. Are There Any Real Prophecies??? A serious problem is that there do not appear to be any clear prophecies that William Branham announced in a publicly recorded sermon that later were clearly fulfilled. If every prophecy that William Branham's followers point to as vindication of his prophetic office were, in fact, only announced as being fulfilled after the fact, how is that evidence of a truly prophetic ministry? With all of his recorded sermons, shouldn't there be some correct prophecies recorded on tape? We have been asking message believers for months to provide us with one single solitary unambiguous prophecy made by William Branham that was recorded publicly (i.e. we can verify on a tape) and that was later fulfilled in a clear manner. To date, no one has been able to provide us with one prophecy that would meet this test. If William Branham was not accurate with even one of his prophecies, then this calls into question his authority as an infallible prophet. While some of these prophecies may still come to pass, other have definitely missed the mark. In the end his prophetic scorecard appears to be “you hit some, you miss some”, and not something you can trust. Was William Branham honest? If he can be shown to have distorted the truth or if his stories are constantly changing over time such that he cannot be believed, this would cast doubt on virtually everything that he said. The following list contains issues that will raise questions regarding his honesty, integrity and truthfulness. Some of these concerns have only recently come to light but they are now sufficient in number to raise genuine concern on the part of anyone who is a follower of William Branham. When you read the concerns listed below, please ask yourself this fundamental question - Why? According to Roy Davis and Douglas Weaver, William Branham attended a Pentecostal church pastored by Roy Davis well before Hope died. Roy Davis himself says that William Branham received the baptism of the Holy Spirit in his home. This all precedes the death of Hope and Sharon Rose Branham in July 1937. Why did William Branham speak such poor English? His explanation was that when he was a boy, his father died. He had ten children to take care of, and had to work and support his mother and the children. But his father died when William Branham was 34 years old. Was he trying to make people feel sorry for him? William Branham relates a story about a man who came into the prayer line at meetings in Windsor, Ontario, Canada. He was there not to get healed but to expose William Branham as a fraud. He had written several illnesses on his card which he did not have, hoping that William Branham would refer to the illnesses that he had on the card, thus demonstrating his gift to be fraudulent. However, this story again changes over time, both in details as to how he knew the man was lying and in what eventually happened to the man. What is truth and what is fiction? Many have listened to William Branham's life story, brushing tears away when they heard the story of Hope Branham's death. How well do you know the story? William Branham did teach things that can be supported by the Bible. However, some of William Branham's theology is just plain wrong and some of his teaching suffers from what we call "Lazy Theology" (he did not take the time to really understand what the Bible said on an issue). These are both serious problems from someone that held himself out to be a divine interpreter of the Bible. Also, a number of William Branham's significant teachings appear to have been borrowed in large part from other men. The details of our finding on this issue can be found in our article on Plagiarism. Jesus died for your salvation, and suffered for your healing. Accepting his sacrifice results in spiritual and physical blessings that are confirmed by scriptures. The early church baptized (immersed) new converts in the Name of Jesus Christ. The book of Acts confirms this, although early Christian writings such as the Didache seem to point to the fact that water baptism in accordance with Matthew 28:19 was also prevalent and acceptable in the early church. On close inspection, it appears that William Branham's prescribed form of baptism cannot be specifically supported by scripture. One problem with William Branham’s teaching on the Godhead is that you can find quotes of William Branham clearly teaching both the Trinity or Oneness doctrines, and then denouncing both doctrines as false. William Branham's teaching appears closest (but not identical) to Swedenborg’s explanation of the Godhead which John Wesley ridiculed. William Branham taught that Cain and Abel were twins, yet Adam was the father of Abel and the Serpent was the father of Cain. When examined closely, this doctrine appears to have little actual support in the Bible. These articles each present an interpretation of scripture as preached by William Branham in the 1960's. While William Branham indicated that these doctrines were taught to him by an angel, it appears that much of it comes directly from Clarence Larkin’s published dispensational teachings. The fourth church age messenger (Columba) died before the start of the fourth church age, and had a ministry as supernatural as William Branham’s ministry. That the dates of the church ages are copied from Clarence Larkin's books. Charles Taze Russell (the founder of the Jehovah Witnesses) was the first person to assign names to the Church Age Messengers (including himself as the Laodicean Messenger). A seven letter word ending in “ham” is evidence of a spiritual man. For more on this topic, please read our article on Doctrines. When this site was created, we were very selective regarding the testimonies that were posted on this site. We verified testimonies, checked them with records we could find, interviewed people we knew and trusted, and looked for respectable character references. Despite our best intentions to present verifiable evidence, we have had to remove a few testimonies of people who we could no longer trust. We encourage you to be vigilant before relying on the testimonies of witnesses. The story in this book about the healing of Florence Nightingale had facts that were so wrong, that the Voice of Healing magazine published an article in 1954 to provide the correct facts, written by a minister in attendance. While an eyewitness to the prophet, he was also accused of swindling a number of Message Believers out of their money in a letter written by Sarah Branham, William Branham's daughter. Pearry Green also wrote that Los Angeles would sink before Billy Paul was an old man (he was born in 1935). Why did we only learn that William Branham preached with Jim Jones after we left the Message? Jim Jones also had a gift of 'discerning the hearts', but ended up committing mass murder/suicide in 1978. We speculate this happened after he realized that he hadn't made the rapture in 1977. I think there can be a lesson in this. Branham, as a miracle worker, had a real place. Branham as a teacher was outside of his calling. The fruits of his teaching ministry are not good. In early 1964, a prophecy was communicated to William Branham that he would pass off the scene before the end of 1965 because of an error he would make. We have researched this prophecy as detailed by Kenneth Hagin and Gordon Lindsay’s wife Freda, and found it to be accurate enough to cause concern. If you have evidence that you are willing to share that can answer any of the following questions, we would love to move any of these items from “serious problems” to “good evidence”, or update our summary of specific prophecies. Was William Branham a Christian? Did William Branham have the gift of healing? Did William Branham have the gift of knowledge? Did William Branham have the gift of prophecy? Are William Branham's prophecies reliable? He sure lied a lot for a Christian. A few were healed, most weren't, and some died. There is some evidence that the discernment was faked. There is no evidence of any "before the fact" prophecies. The gifts of healing and of the word of knowledge are gifts of the Holy Spirit that are placed in the church for the benefit of all. There is no scripture in the New Testament that state that these gifts are vindication for a special prophetic ministry. William Branham seemed to really, really want to be an Old Testament-style prophet. Sadly, the Old Testament prophets were not able to live up to the law that they were under. Solomon had the gift of wisdom, but ended up worshiping false gods. Samson had the gift of strength, but ended up powerless to temptation. Even Moses and David had faults that got them in trouble with God. To become an Old Testament prophet, William Branham had to start teaching the law. He began focusing on outward conformation to the “rules” in the Bible (tithing, hair, divorce), and eventually left the weightier matters. 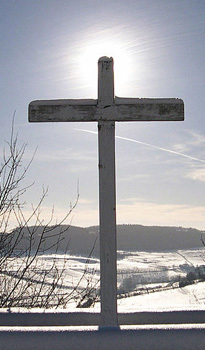 Let's be simple Christians who believe in Jesus - his death, his resurrection, and his power. A "mighty revelation" won't do us any good if we don't have the love of Jesus Christ, and love for others. Some followers of William Branham even preach a "Third Testament" doctrine, which replaces grace with revelation. A month before his passing, William Branham was teaching that Elijah was Jesus Christ. He had defined God into the box of his own life, and appears to have started exalting himself over the church of God. Today, if you go into a message church, you will often hear a long sermon that will likely end with a focus on outward conformity (proper clothes, hair, doctrine, pray more, be more sincere), the “vindications” (stories about his healing and discernment ministry) or comparisons (such as, "I’m glad we’re not like secular Christians who aren’t saved by knowing Message doctrine, like we are"). You will also find people who just can’t seem to conform to the preaching, others who can willingly meet all the rules but don’t understand why, and people who need (but are unable to access) the healing that is being preached and promised. The sad part is that these people are all Christians who have simply forgotten the power of faith in Jesus’ atonement, and replaced it with faith in a gifted man. William Branham said that every man will get caught by money, power or women. For him, what originated as a gift of healing became a display of power over diseases, which seems to have ultimately led to a desire for dominion over the church through his “my way or the highway” preaching. So, William Branham’s life may more closely parallel Solomon’s life, or Samson’s life, than Elijah’s life. Or, he may have been a complete fraud. If you experienced "disequilibrium" when you read this article (frustration, nausea, dread, guilt, anger, embarrassment, anxiety, or other similar symptoms), this is only natural. It is a condition that is referred to as Cognitive Dissonance. The main question is where do we go from here? The answer is back to the grace of the New Testament covenant. Sound strange? If so, it’s because we as message believers haven’t realized (or forgot) that it was Jesus’ blood, and not William Branham’s doctrine, that has kept us clean before God. Even though we really know that in our hearts, we haven’t let it permeate our being like the scriptures teach. So, this letter is an encouragement to get back to our first love, Jesus Christ, and the Good News of his grace. If you need help, please click on this link. Read the article called Here we stand, corrected for more information on those who have left the Message to pursue Jesus Christ. ↑ The New King James Version, 1 Ti 3:2–7 (Nashville: Thomas Nelson, 1982). ↑ The New King James Version, 1 Co 12:7–11 (Nashville: Thomas Nelson, 1982).